sam bot dot com :: Bible Bar! Yeah. I saw it in the store and I just had to. I couldn't resist. 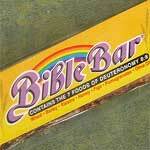 I needed to know what the seven foods of Deuteronomy 8:8 taste like... in bar form. And the result? Well goddamn goshdarn! That's one divine Bible Bar.